The USB 3R is a small-sized device whose typical position in the system is not necessarily in a visible place, since the user never interacts with it, beyond the initial installation. However, its good quality chassis, made of an aluminum extrusion, the distinctive monochrome lettering, and its two LEDs, informing the user about the "On" and the "Lock" state, clearly show that Ideon gave some attention to the details. Therefore, it is more likely that the user will try to place the USB 3R in a place where it can be seen, for purely aesthetic reasons. 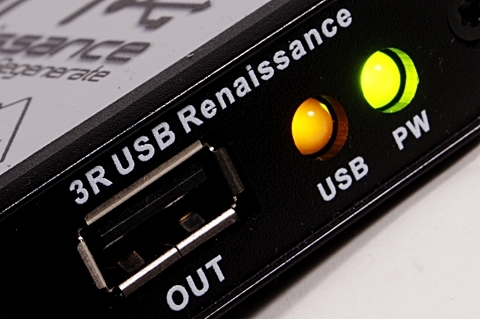 The 3R USB Renaissance is a compact, well-built device that can be placed anywhere in an equipment rack. Two LEDs on the front panel, display the Power On and Lock status. 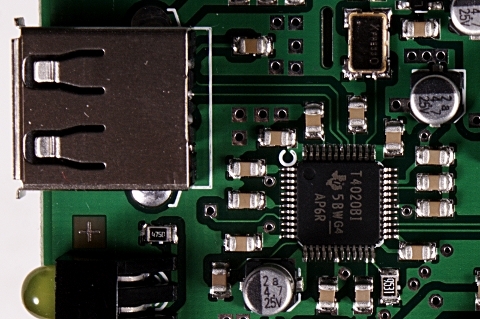 In terms of connectivity, there is not much to say: The user has a USB Type B connector, where the cable coming from the host computer is connected and a USB Type A connector as its "output", where a second cable towards the DAC should be secured. A standard power supply connector, for the external power pack is, also, included. The physical appearance of the USB 3R is quite deceptive and in contrast to its inner workings. The small PCB includes all the necessary electronics to improve the USB signal transfer conditions. Immediately after the Type B plug is the signal conditioning circuit (TUSB211 from Texas Instruments). This circuit compensates for the problems caused by InterSymbol Interference (ISI), an effect in a telecommunication channel, where one symbol interferes with subsequent symbols of a stream. This effect gains in importance as the length of the transmission line increases and, also, as the data rate increases (in High-Speed USB 2.0 connections the data rate is quite high, at 480Mbps). Ideon's attempt to control all the USB signal parameters results in a quite complex circuit. 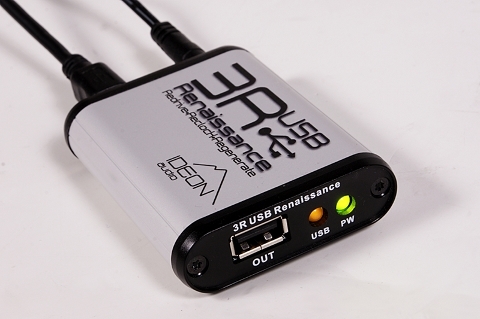 The 3R USB output port is driven by a USB management chip (it is, in fact, a USB hub). Here, re-clocking is applied. The crystal which controls the clock circuit is shown at the top of the photo. The TUSB211 output feeds a USB signal management chip (in fact a USB Hub), the TUSB4020, also from Texas Instruments. 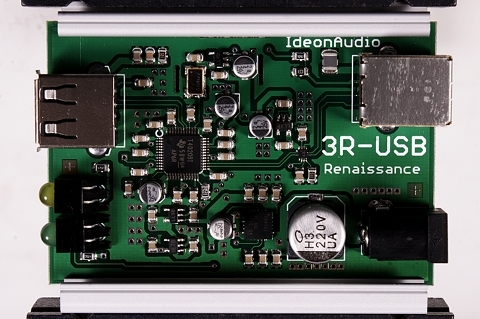 This stage re-clocks the data through a clock generation circuit included in the USB 3R. The hub output is directly connected to the USB Type A plug and from there, the stream is headed to the DAC. Of particular interest is Ideon's approach to the power supply powering all of these circuits. Making a choice that would be disconcerting in every standard manufacturer's accounting department, they used -if we counted them correctly- a total of five regulated power supplies. 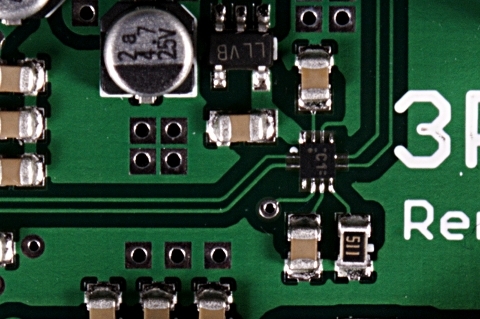 The scheme includes a main supply, designed around a TPS7A4701 (a component specifically developed for noise-sensitive power supply applications), which controls the voltage from the external power pack and four local regulation circuits, for the signal conditioner, the clock circuit and (two) for the USB hub (since this chip requires two different power rails). 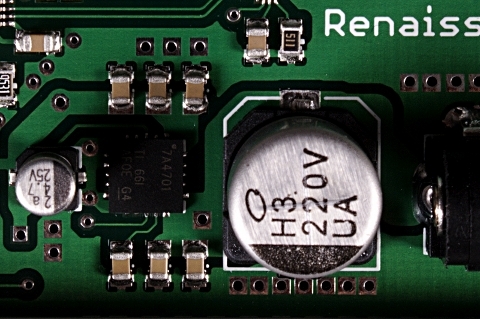 With the external pack rated at 7.5V (1A) and the active circuit components requiring 3.3V and 1.1V, the regulators are working quite hard, which is evident from the fact that when using the device, its chassis gets moderately but noticeably warm. Ideon paid some serious attention to the power supply design. 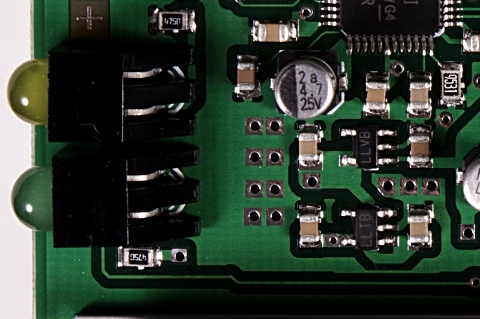 The USB management chip required two different voltage regulators. This is the signal conditioner. One thing worth noting is that the input and output pins (the pairs seen to the left and the right side of the chip) are in a position and distances such that the transmission line is not disturbed, and, in fact, not interrupted at all. At the top left is one more voltage regulator. On the basis of all the above, 3R USB controls the transmission line quality (through equalization), applies its clocking conditions and offers a highly regulated and low noise power supply. In fact, there is no stream parameter not controlled by the device, justifying completely the title "conditioner". This is the main power supply of the device. It manages the voltage coming from the external power pack and distributes it to the local voltage regulators.